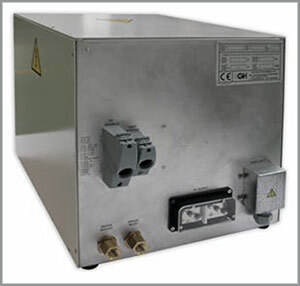 Our new HM Series RF power supplies present an exciting new alternative for precision industrial heating applications. 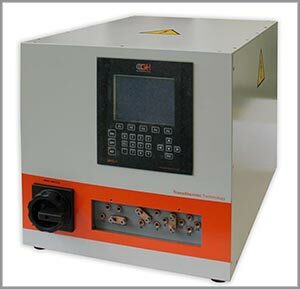 With 10 or 20 kW of output power over a wide 50 to 150 kHz operating frequency range, and 30 KW from 50 to 100 kHz, these models are ideal for applications such as brazing, shrink fitting, annealing, curing and tempering. With a fully digital, compact design, these new power supplies deliver maximum reliability and repeatability in a small, 17”W (432 mm) x 26.2”D (665 mm) footprint. Each unit weighs approximately 94.8 lbs. (43.7 kg). For process control, these models offer a choice of local or remote control operation. The large front panel MPC-1 liquid crystal display offers up to 16 different heating programs for local operation and 4 in remote control mode. Remote operations are handled through external signals. The tune function enables an automatic search for the resonant frequency. The heat station is externally located. NPT connections for water cooling are conveniently located on the rear panel. The output circuit is based on a parallel tank with an impedance matching system. Parameter controls include power and voltage regulation; the LCD also provides alarms and threshold visualization. The MPC-1 can be programmed for English, Spanish, French, German, Italian, and Portuguese. The output circuit is based on parallel tank with an internal load matching system. The main benefits of these new power supplies include increased productivity and parts quality; energy savings and reduced production costs; ease of operation; full process control; environmentally-friendly process with low noise level and no toxic gases.